Get Your Instance · User guide of MISP Malware Information Sharing Platform, a Threat Sharing Platform. The intention of this chapter is to support you in getting your own MISP instance up and running. CIRCL maintains the image of a recent MISP virtual machine online. This VM is generated after every commit to the main MISP repository on Github. This is a very easy out of the box solution, optimized for product evaluation and to support trainings held by CIRCL staff. The best place to get the latest version of the MISP virtual machine, as well as all the available training materials is the MISP training materials page on the CIRCL website. Download the image of the virtual machine and validate the SHA512 fingerprint. 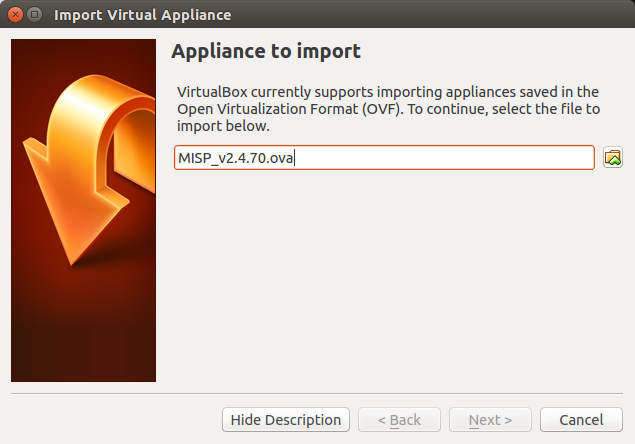 In VirtualBox use the "Import Appliance..." functionality to import the virtual machine. The instructions in this manual covers VirtualBox only. If you prefer another virtualization solution like VMWare you can find some quick instruction on the MISP training materials page. ESXi Servers have been tested too. Should work without problem but some manual changing of the ATA-Bus is needed. The MISP image is pre-configured to be reachable on the private IP address localhost by SSH on port 2222. The GUI is reachable by http://localhost:8080/. You should have two interfaces on your VirtualBox configuration (NAT and host-only). 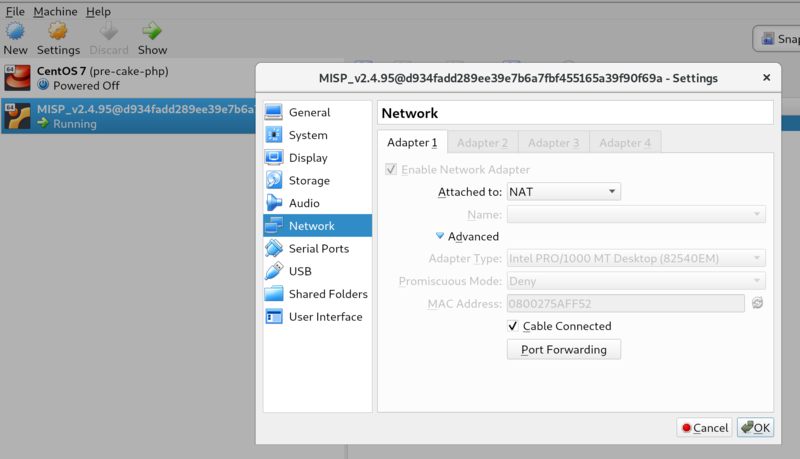 You can also configure access to the MISP instance by doing port forwarding on the NAT interface. If the port is already used on your host, virtualbox will still boot and all the other ports will work. The reason that some entries have 0.0.0.0 and other are left blank is due to a virtualbox bug where traffic would not be sent to the Guest VM. VMWare users will need to connect to whatever IP the VM has on your host. 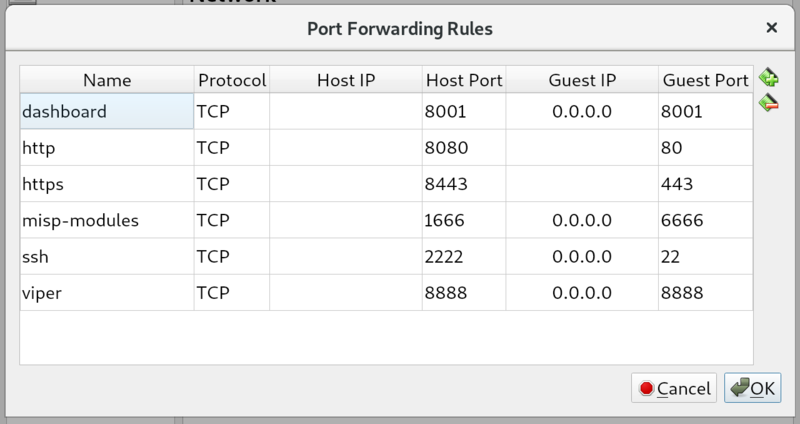 There is NO port forwarding done fo r VMWare. You might have a very old VM installed and the ports are not be forwarded. Either configure the port forwards manually or download a new VM.